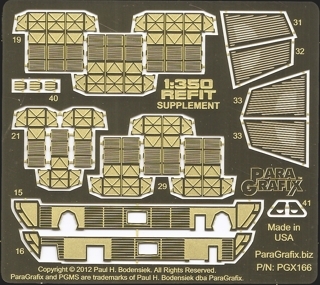 Coinciding with the release of Version 2 of our popular 1/350 scale Refit Photoetch Set, ParaGrafix is making the additional pieces available for hobbyists who already own Version 1. PLEASE NOTE: We DO NOT sell the original version of the Refit Photoetch Set anymore. If you are ordering PGX111 you DO NOT NEED to purchase this set unless you want additional cargo pods.